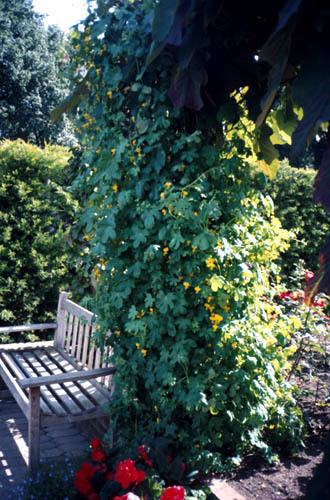 You can let Canary Creeper spread over the ground on its own, ramble up a trellis, or scramble over shrubs and around other plants. It owes its common name to its showy yellow flowers with deeply fringed petals that resemble the wings of a canary in flight. Prefers warm, dry conditions. Prefers poor, sandy soil. Overly rich soil deters flowering. If grown supported by a trellis. If allowed to spread over the ground. 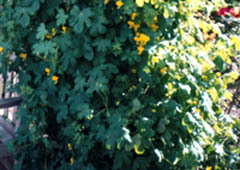 Leaves are lobed and hand-like. not native to North America - Native to Mexico and Central and South America. Propagate by seed - Plant seeds indoors 4 to 6 weeks before the last frost date. Direct seed outside after danger of frost is passed. Train onto supports or plant where other plants can support it.